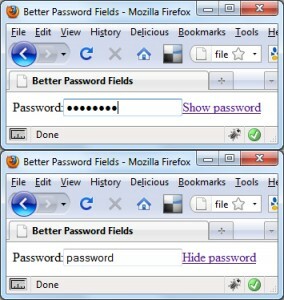 The ‘whether or not to show plain text in password fields for usability’ situation has never really been resolved to my satisfaction; plain-text fields are clearly much more usable and less confusing than obscured passwords, but what if the person using the plain-text field is sat in a public place? Showing their password for just anyone to see would be ludicrous. The iPhone style of obscuring everything except the last letter is a good compromise that offers a combination of security and usability, and there are plenty of great guides out there on how to implement this in your web pages. But it’s still based on the flawed assumption that the user is always going to be somewhere public. And it’s not 100% secure anyway because if someone watches each letter as it’s typed over your shoulder, depending on what the password is, it could be very easy to remember. The point is that we don’t have to rely on a compromise when a solution is easy to implement. The solution is to hand the initiative over to the visitor and let them decide for themselves whether to show the password in plain text or not. Then we don’t have to either use a semi-hidden, semi-secure way of presenting the field, and we don’t have to make the choice of whether to show plain or obscured text. All we need to do is add a simple link after the password field which will convert the obscured password field to a standard text field, thus revealing the password. That’s all of the underlying HTML that we need – nothing more and nothing less, the very definition of semantic. Everything else we need we can add using the script, which we’ll look at next. All of our code will reside within a self-executing anonymous function which we pass the jQuery object into. Our function accepts the jQuery object using the $ parameter so it is safely aliased within the local scope of our function, which should offer protection from any other libraries that may be in use on whatever pages the code ends up on. All we need to do at this stage is prep our password fields by adding the ’show plain text’ links after each password field. We first select all of the input fields that have a type of password (that’s just one in this example, but there could be more on pages out in the wild), then for each of the selected elements we create a new anchor and insert it directly after the current input field. The new anchor has its title and href attributes set (some browsers won’t treat it as a link if it doesn’t have a href), and we give it a class name of show-plain (mostly so that we can select it in just a moment but potentially also for styling purposes). We use the live() method to add a click handler for the ’show plain text’ link because, as you can probably tell from the code above, the class name of the link changes. Using live() means that we don’t have to re-bind the click event every time we create a new link; the live() method uses event delegation which attaches a listener for this event to the specified element’s parent instead of binding directly to the element itself. Within the anonymous function added as a parameter to the live() method we first cache a reference to the input element directly before the link that was clicked, so the variable will always refer to the correct input element regardless of which link is clicked. We cache it because we’ll be referring to it several times and we don’t want to have to select it from the document each time we want to do something with it. title: "Show the password in plain text"
This is pretty much the reverse of what we did in order to show the text; we just remove the plain text field, copying its value, id and any class names, and then replace it with a new input of type password. We also adjust the link again to reflect the new state. We should find that when we load the page we can enter text into the field and switch between plain and obscured text as in the previous screenshot in any common mainstream browser. In terms of usability nothing can be better than giving your visitors a clear and simple choice; in this case whether or not to show a password in plain text or obscured text. We saw how easy it was to add this simple solution to a page – just a couple of lines of code. So instead of offering a compromise we can offer a solution, and improve the usability and effectiveness of password fields on our sites at the same time. Awesome idea—I’ll have to try this when I get home. One question though: is there a reason why we can’t just alter the type attribute of the tag? Does this not work in some browsers? @Samir Thanks :D Yeah, switching the type attribute didn’t seem to work too well (don’t think I could get it working in any browser) so this really seemed the easiest method. I notice that you left off the “name” attribute when transferring the attributes from the old input element to the new input element. Is this by design? I would imagine that the name attribute would be rather important otherwise the password field won’t be submitted when the form is submitted. Also… you have a missing > character in your HTML on the closing password label tag. I’ve set a couple of options to allow whoever uses it to show cleartext passwords by default if needs be and also to customise the checkbox text. It’s a little outdated now though as it doesn’t harness jQuery 1.4’s construction of dom elements like your great example here. This is really a cool idea. I could use that in a customer project right now where its possible to show the password to the user again if he wants that. That’s pretty cool! It’ll be handy for pages like Edit Profile or Registration. 1) How can we position the “Show Password” text link to wherever we want in the page ? it is very annoying to get restricted to put the link right after the password input box. Can you please give a simple script modification ? For example, put the text link after a image file in page. @merih from a usability perspective it makes sense for the link (or checkbox) to be close to the field it’s attached to. In my example there is just the one text field, but in a form with many input fields it would need to be close. That said, you could easily adjust the position using CSS, and if you needed to you could change the element that the link is inserted after. After I tried soo many things and countless modifications based on your explanation,I got no result. I do not know where I do the mistake. All I want is to see a simple chekbox and Show password positioned with CSS. I am really hoping you could give more hint, or better a script sniplet to see a light on the way. Would you ? There are many other Show/Hide password scripts but somehow I see that your solution is more suitable to use really. I believe many people would agree on that as well. Great post thanks. I’m using your technique on checkboxes and working well. The questions is, how can I make possible it one-and-one for all checkboxes iteratively? not sure what you mean, please clarify? Sorry for my english! I need control all checkboxes. Actually I solved my problem almost. But I need little help.